Now that I don’t have uni, I don’t know what to do with myself, when I come home before 10.30 pm. Therefore, I go to the cinema. Yesterday brought me Hancock and Kung Fu Panda. Hancock was fun. Did I mention that I like Will Smith? Because I do. And Jason Bateman, and Charlize Theron. There’s hardly a movie, where so many likeable actors are together. It had the most blatant product placement (for youtube) I have ever seen in a movie, and the weird thing is – it was actually pretty natural. And worked. I mean, I wasn’t surprised that she has superpowers as well, that was clear to me after her first look at him (but obviously not to the rest of the audience, because they gasped the hell out of the movie, when they saw her throwing the refrigerator). But when they are both at the hospital… I didn’t even mind the plotholes the size of Germany anymore. 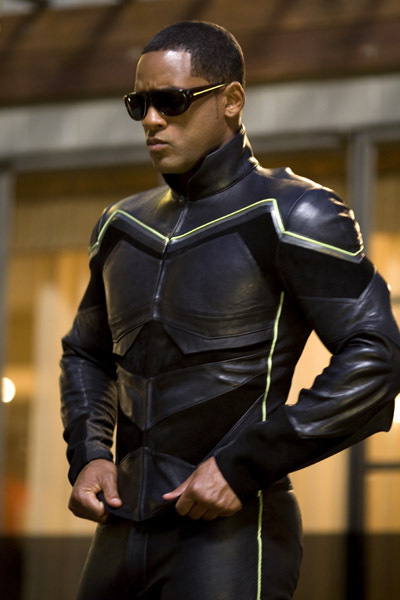 It won’t be my favourite superhero movie of all times (Nothing beats Superman IV :P), but it’s a solid one. Kung Fu Panda was great. I was at the theatre in a room filled with adults, who all laughed their asses of. Seriously, there was not a single child in sight. I really enjoyed it. They had great voices (although, Seth Rogen should have been allowed to talk more), the animation was good and the story really sweet. The only thing I have to critisise: Not all fat people are just motivated by food, or eat all the time. And it would be great if one movie didn’t follow that stereotype. But then again, it’s a movie with Jack Black, I don’t expect them to break all the conventions. I liked it, I laughed and I’m thinking of seeing it again this weekend, with my nephew, who will surely love it. This entry was posted in movies and tagged 2008, Charlize Theron, Hancock, Jack Black, Jason Bateman, Kung Fu Panda, Seth Rogen, Will Smith by kalafudra. Bookmark the permalink. But didnt you feel Hancock was too friggin’ contrived? I have no problem with a movie driven by deus ex machina (Oh Brother Where Art Thou), but this was too much for me to take. To me, everything felt too tacky and too forced from the start. I hated it. 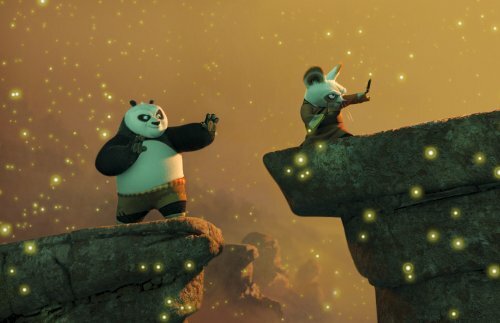 Kung Fu Panda was great fun, I loved it too, despite all the stereotyping. Honestly, I really don’t see more Deus Ex Machina than in other movies. It was logical in its own world, even though there were plot holes, I’m not denying that. But I never thought they got too disturbing. So, no, I don’t think it was too contrived. If it was, there wouldn’t have been any plot holes left. I really liked the movie as a fun watch, something which I can just enjoy without thinking. I didn’t expect more than that and that’s what I got. I don’t really know Aishwarya Rai, but I think Charlize Theron was a good choice. I was surprised that she did the movie, though. Aishwarya Rai can make a wooden doll look expressive. Charlize, on the other hand, seems to have done a great job, at least going by the NY Times review. I think she did a good job, too. But I guess, since Monster you can put her in any shape/form/movie and I still will be convinced that she’s a terrific actress.